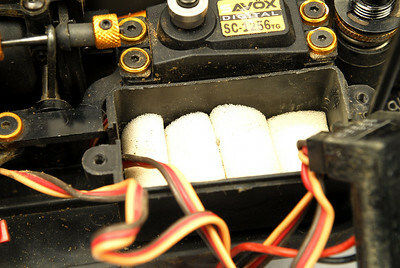 Another important point to consider is the servos used in the car. 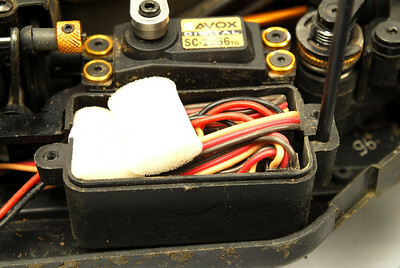 An RTR is good for beginners, and can even be raced, but usually not with the stock servos. The servos need to be fast and strong enough so they respond fast enough to driver input. Slow weak servos will make a car impossible to drive fast. In my opinion the absolute minimum requirement for servos is, all metal gears, 10kg, 0.16sec/60deg at 6V. Fill the receiver box with foam padding to protect the receiver, and use the rubber grommets for the servos, let the servos move a bit. Set the steering and throttle end points so the servo isn’t trying to force more throttle or steering than what is possible. Make sure the throttle linkage returns the engine to idle without delay, at all times when the servo is at neutral. Make sure the brakes don’t drag when throttle servo is at neutral. The throttle/brake linkage should be set up simply and precisely. Make sure the carb returns to idle, and brakes don’t drag. Ok, so the car is built right, the electronics are installed correctly, the engine is running well (a whole other guide), there is one more critical, and often overlooked point. The clutch. Usually when an engine that has worked well, starts bogging, it’s because of the clutch. A worn out clutch, will either start slipping, or bogging, and neither is good. Clutchsprings and clutchshoes are parts that need changing, and there’s nothing you can do to avoid that. Same goes for the clutchbell bearings. For anyone seriously racing, I suggest you put new clutchbell bearings on for each race, and preferably also the clutchshoes and springs. The clutchbell lasts longer, but keep an eye on the grooves that wear into the bell. When it is all grooved up, it’s time to change. I am personally quite picky about my clutch. I put a new clutch and bearings on for the race, and again a new ones on for the finals. In order to improve your car, and your results you really need to try everything for yourself. Make a plan. Don’t just drive for the sake of driving. Figure out what you want to do. 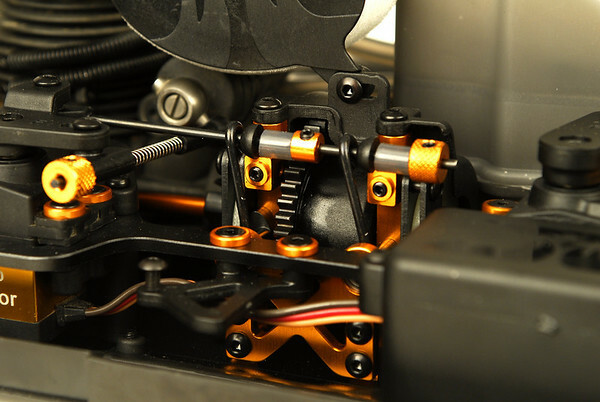 Try different upper link settings, or different shock pistons, or springs, or whatever, and focus on what each change does. Make one change at a time, and write down what changes on the car in a notebook, and after every change take lap times and mark them down too. Write what the changes did to the handling, what did you feel? Do this for a couple of days, and then go and do the exact same thing on another track. Another important thing to remember is, that if you change one thing, for example the rear link, or rear shocks, and it is worse, it may actually be better than what you use to have if you also chage the front link or shocks. So one change might be worse, but 2 changes could be better! So it really is a never ending challenge, with infinite combinations of set ups to try. One month of testing like this is endlessly more valuable than just going to the local track to drive, or copying a set up off the internet.